Keeping your beautiful suede items presentable can be a bit of a challenge thanks to the material’s delicate nature. Suede is usually made from pig, doe, or cowhide, and can scuff easily, making it one of the more difficult materials to clean. That’s why it is usually recommended that you get your suede items professionally cleaned by an experienced dry cleaner. However, this can get expensive. For small stains and scuff marks, you can learn how to clean suede items at home using the following methods. When you aren’t using your microfiber suede items, it is crucial that you properly store them, in a dark and dry environment. Never store suede in plastic, instead place them in a pillowcase or cloth bag, and never use newspaper, as the ink can penetrate the fabric, causing it to become discolored. When wearing suede place a lightweight layer of clothing between the item and your skin to prevent stains from your lotions, creams, and body oil. If you find that your suede has become dirty or stained, follow these simple techniques for cleaning suede. Suede shoes are incredibly vulnerable to scratches, scuffs, and stains. Because suede material contains tiny fibers, it can be a challenge to clean but knowing how to clean suede shoes can be extremely important. With the right tools and knowledge, you can clean suede shoes and get them looking like new. Here’s how to clean sneakers and other suede shoes. 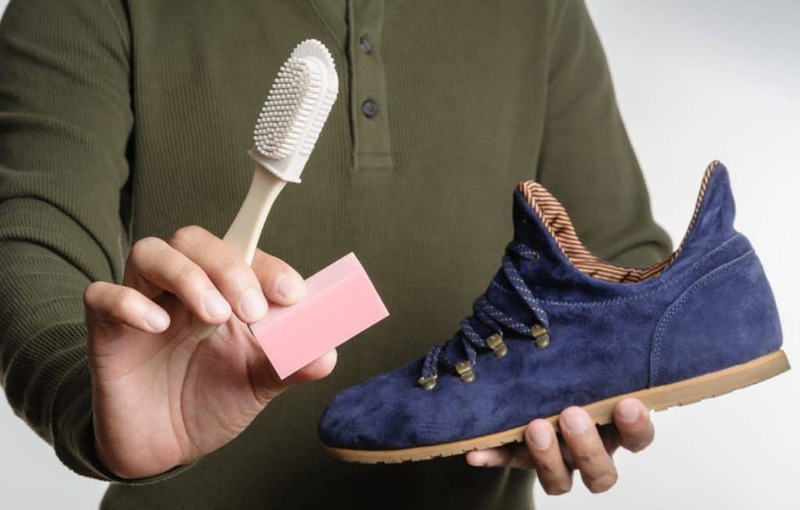 To clean dirt and scuff marks off your suede shoes, you’ll need to get a suede brush. Before you begin, make sure that your shoes are dry to avoid damaging the material and spreading stains. The soft grain of the suede is extremely sensitive to water, so using a unique suede brush to deal with basic scuffs and dirt is the best suede cleaning method. To remove dust from suede shoes, gently brush the area with the suede cleaning brush. Be sure to brush repeatedly in the same direction rather than back and forth. Scuff marks are a result of the suede grain getting pressed down in one direction. You can lift the grain and remove scuff marks by vigorously brushing the scuffed area back and forth with your suede cleaning brush. If the scuff marks are stubborn, and you aren’t able to remove them with the suede brush, you can use a pencil eraser to erase the marks. Apply a moderate amount of pressure and increase the pressure if needed to remove tougher marks. Water is a natural enemy of suede. Even just a few drops of water can end up leaving visible marks on this delicate material. You can quickly remove water stains from your suede shoes using the following method, which is the best way to clean suede shoes. Before treating the stain, you have to allow the suede to air dry thoroughly. The last thing that you want to do is try to speed up the drying process by applying heat. You can use a hairdryer on the coldest setting if you need to dry the material faster. The easiest way to remove a water stain is to apply a light coat of water over the entire shoe with the suede brush. While water can discolor suede, when used correctly it can also remove the stains. Using a sponge or paper towels soak up the excess water. Gently dab the entire shoe until it is evenly wet, and you are no longer to see any visible water stains. To blot excess water from the inside of the shoe, stick dry paper inside. This will also help the shoe retain its original shape. Avoid using newspaper, because the excess ink will soak into the suede. Place them in a well-ventilated area and let the shoes dry overnight. Once the shoes are dry, use the suede brush to gently brush the nap of the suede and release the grain back to its original look. If any stain remains, use the suede eraser to erase the marks. Grease and oil stains can be particularly challenging to remove from suede shoes. However, you can get out oil stains with a nail brush. Start off by scrubbing the stain with a suede brush, like you would for a scrape. Then, use a nail brush and warm water to clean the stubborn stains. If the oil or grease stain is fresh, you can apply cornstarch to the stain and let sit overnight. The next day, using the brush, remove the starch and then mist the stain with an iron. Before you start cleaning mud from your suede shoes, you want to wipe away the excess without applying too much pressure to the suede. Leave the shoes in a sunny, dry spot until the mud has hardened. When the mud is dry, you should be able to break off the bigger chunks with your fingers easily. Then, break off the remaining dirt particles with the suede brush. If you happen to get chewing gum or wax stuck to your microfiber suede shoes, you can get rid of it by placing your shoe in the freezer. The freezing method works not just on shoes or boots, but it is also an excellent way to remove candle wax from carpet. Just use simple ice cubs and spot-freeze the stain. The gum or wax will eventually become hard after spending some time in deep freeze giving you the ability to chip away at the larger chunks. Once you’ve removed most of the stain, you can finish the cleaning by scrubbing the area with your suede brush. If you find that your suede shoes have been stained with blood, a simple ingredient that you probably already have in your house can help lift the blood out of the fabric. Soak a cotton ball with hydrogen peroxide and gently dab the stain. Continue to dab at the blood until it has been removed from the suede. If you happen to spill ink on your suede shoes, don’t throw them away just yet. If you act fast, you can remove ink stains before it sets. First, you need to blot up as much of the ink as possible using a clean, white cloth. Then, pour rubbing alcohol on a cotton ball and gently blot the stain. If you discover that the ink has already set, scrape the stain off with the sandpaper, gently rubbing with the nap of the suede. If there is a particularly stubborn stain that you aren’t able to remove with the above methods, you can use white vinegar to remove the stain. Similar to when you are cleaning leather shoes, you are using white vinegar as the main ingredient for your stain cleaning recipe. Apply a modest amount of white vinegar to a soft towel and gently rub the suede. Allow the material to dry, then carefully agitate the area with the suede brush. This method can also be used to remove salt lines that appear on the suede. Suede boots have been in and out of the fashion spotlight for years, which means it’s highly likely that they will always have a place in our wardrobes. While suede boots are beautiful to look at, not many people know how to properly care for them. Cleaning suede can be extremely challenging because if you don’t do it right, you can ruin your beloved boots. With the proper tools and techniques, you can ensure that your beautiful suede boots will last for years. Suede is especially sensitive to dirt, water, and salt and should be routinely cleaned and cared for to help prevent unsightly stains and damage. If your boots are discolored, have blemishes, or are visibly dirty from wearing, they need to be cleaned. They should also be washed after prolonged exposure to salt, water, mud, or other harsh elements. A good rule of thumb is to lightly clean your boots after wearing them 10 times! The first step to cleaning your suede boots is to use a suede brush to brush off any loose dust, dirt, and grime. You want to be sure to only brush in the direction of the nap, to avoid ruining the suede. Since suede is such a delicate material, you want to be sure not to brush too aggressively to keep from destroying the material. When it comes to removing more difficult spots and stains, you can use a suede eraser. Not only will a suede eraser work well on dried stains, but it will also help return flattened nap to its original position. At this point, your shoes should be free of stains and dirt. 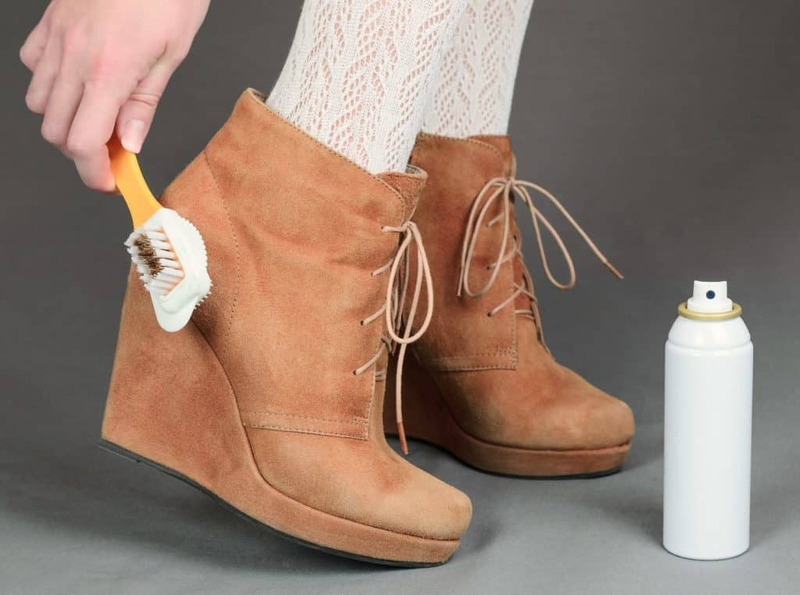 However, if you are dealing with stubborn stains and marks on your suede boots, you may need to use a homemade suede cleaner. Pour the alcohol into the spray bottle. Spray the stain with the isopropyl alcohol and using the sponge, gently scrub the area using a circular motion. Use the toothbrush to tackle smaller stains and allow the area to dry. Using a suede brush, lightly brush with the nap to fluff the material. You can also use a commercial suede cleaner to tackle tough stains on your suede boots. The key is to apply the cleanser in an even coat to avoid discoloration and spotting. Using the suede brush, brush in the direction of the nap. If spotting occurs, reapply the cleaning solution more evenly and repeat the process. After you’ve spent the time to thoroughly clean your suede boots, you should consider protecting them with a commercial suede protector to provide extra protection from staining. Before applying a suede protector, make sure that your boots are completely clean and thoroughly dry. Spray an even amount of the protector on your boots and allow to dry completely before wearing again. When it comes to your suede purse, you need to take extra care to ensure that fluids don’t spill on the bag and create unsightly stains. Suede is a kind of leather that has a smooth, velvety feel. It is produced from a thin, inner split of leather. The soft, nap texture of the material is created by abrading the leather with an emery wheel, which makes it highly absorbent and easily damaged by water, as well as stains. Take the towel and rub the purse using moderate pressure to help eliminate watermarks and surface spots. Be careful not to rub too hard to avoid spoiling the texture of the material. With your suede brush, clear the fine debris and dust from the surface of the purse and restore the appearance of the suede material. Next, you’ll want to remove any stains on the material. Due to its high absorbency rate, these may be your biggest challenge when cleaning your suede purse. Grab the pencil eraser or sandpaper and gently rub the stain until it disappears. Once you’ve removed the stain, use a soft, clean towel to rub the purse down. You can also use stale bread to remove the stain, by rubbing at the stain until it disappears. After you’ve spent your valuable time cleaning your purse, you may want to take a few more minutes to condition the bag. Using a leather conditioner on your suede purse will help it to maintain its attractive looks for much longer. A conditioner will also give your purse a new look and extend its lifespan. To make your own simple and effective homemade leather conditioner, pour the olive oil, and vinegar into a spray bottle, and add the essential oil. Place the lid back on and shake vigorously to ensure the ingredients are thoroughly mixed. Spray a small amount of the conditioner onto a buffing cloth. Rub the mixture into the purse using short, steady strokes. Make sure also to condition the inside of the purse, paying close attention to the corners and along the seams. To reduce the occurrence of stains maring your suede purse, take the necessary precautions to prevent stains. Use a suede protector to help waterproof the bag and prevent stains from turning your beautiful purse into a thrift store find. 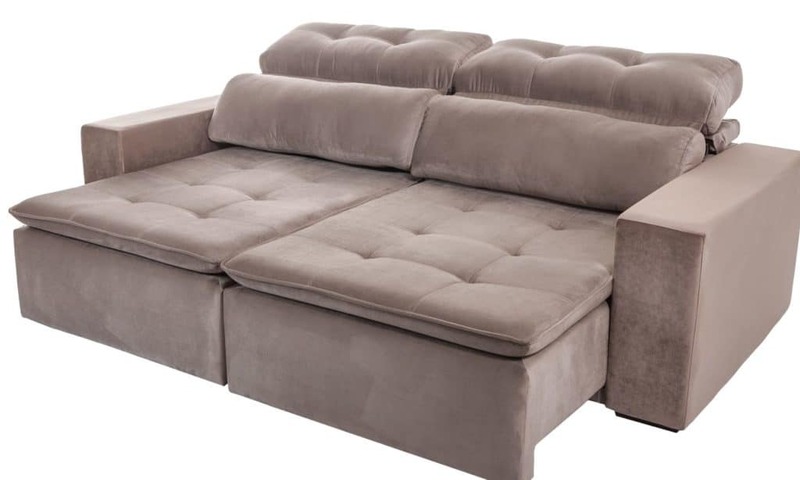 A beautiful addition to any home, microfiber suede sofas have become a cozy centerpiece for many households. They are known for being stylish and soft and has become a popular choice for many homeowners. One drawback of having a suede couch in your home is that the material can be a challenge to clean. Follow these easy cleaning steps to keep the most comfortable couch and upholstery clean and fresh. 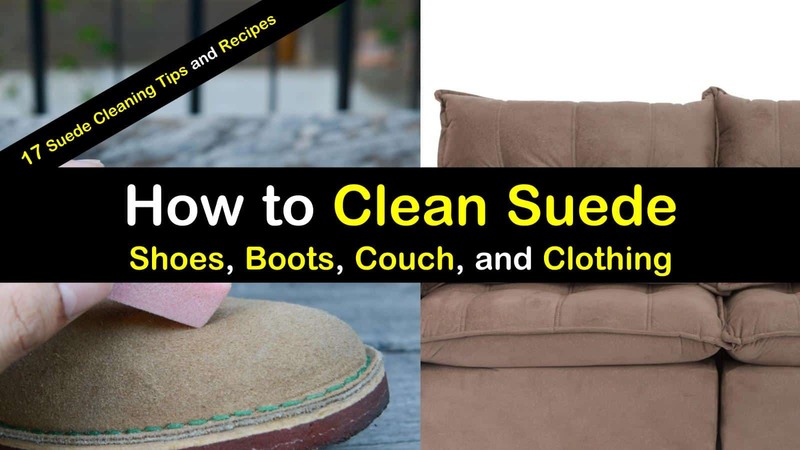 The first thing you need to do when cleaning spills from your suede sofa is to determine the type of material you’re dealing with, so you can use get the right microfiber couch cleaner and the proper cleaning method. You can usually find the tag underneath the couch. If you are unable to find a label, move forward as if you have an S-label sofa to be on the safe side. Always test-clean on a small spot to ensure it won’t stain the material. If your suede couch has a W-label, you’ll want to create a water-based solution using warm water, several drops of mild, liquid dish soap, and a teaspoon of baking soda. Add the ingredients to a spray bottle, the spray the specific stain you’re trying to clean or work in small sections if you want to freshen the entire couch. You want to dampen the cushions, just enough to loosen the dirt. Avoid soaking the cushions because it will take forever to dry. Using a soft white towel, gently rub the area using a circular motion. Once the material is completely dry, use a soft scrub brush to gently massage the fabric to fluff the fibers, making it look brand new. If you’re working with an S-labeled couch, you need to clean it with a solvent based cleaner. Rubbing alcohol works great to clean suede furniture. Fill a spray bottle with rubbing alcohol and spray the stain directly. Use a soft, white towel to rub the rubbing alcohol into the stain. Be sure to use circular motions over the sections that are saturated with the cleaner. Finally, once the couch is dry, use a soft scrub brush, to gently rub the area to help fluff the fibers up. Suede is much softer and more vulnerable to the everyday wear and tear than ordinary leather. Not only is it easier to stain than leather, but it is also more challenging to clean. Unlike leather, when you use usual cleaning methods, the stains on suede can get much worse. So, knowing how to clean suede properly is extremely important if you want to keep your suede jacket, shoes, and other accessories looking pristine. The previous methods will help you accurately clean all the suede in your life and keep it looking new. 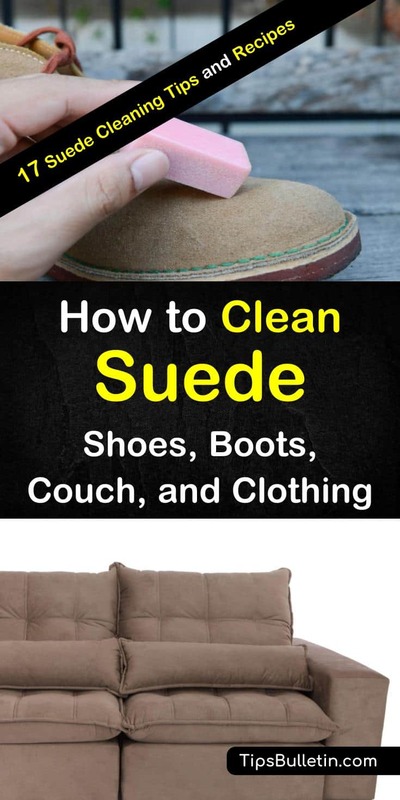 We hope you enjoyed learning how to clean suede. If you found the information in this article useful, please share it with all your family and friends.